My twelfth book in the Aimée Leduc Investigation series, Murder at the Lanterne Rouge, has just come out. But when I began writing I never thought I’d finish a book, much less set it in Paris or write a series. Or that my twelfth book would take Aimée back to the Marais, the site of her first investigation. I wasn’t a doctor, a policewoman, a sketch artist or with the FBI. I was a mom, a preschool teacher, and had old friends in Paris. The total sum of my qualifications apart from reading and loving mysteries. I did grow up in a Francophile family in the SF Bay Area and attended a French Catholic school. My father was a Francophile and loved good food and wine. In the fifties my uncle went to France and studied with the artist George Braques, so talk at our dinner table was a lot about France. I lived in Europe when I was college age. It was the story of my friend’s mother, a hidden Jewish girl in Paris during the German Occupation, that drove me to write. I’d heard this story when I visited the Marais with my friend and just felt somehow, someway I had to write this. This led to three and a half years of writing in what became Murder in the Marais. During the process I’d discovered I couldn’t write as a French woman, I can’t even tie my scarf the right way. But I began spending more time in Paris in the mid-1990s to develop Aimée Leduc, my PI turned computer security sleuth. I interviewed three female detectives in Paris who ran their own detective agency and took qualities from each. It became important to me that my character, Aimée, be half-American, half-French; be a young, contemporary woman like the Parisian women I know, have a strong fashion sense and be fierce in her pursuit of justice. The justice that eludes people sometimes in daily life. And that she know much more about computers than I do. “Matter of fact, the story takes up right after the Marais.” I said the first thing that came into my head while running to my computer. My bright idea since I’d just stayed in that district with my friend, a single mom whose daughter was the same age as my son. I slept on her couch, took her daughter to school, paid her gas bills and saw another side of Paris in doing so. OK, this was before the movie Triplets of Belleville. And there I was powering up my computer, searching for my notes, napkins from the Belleville bistro, my photos and I had a goal. Aimée was going to Belleville, murder somehow would be involved, a problematic relationship with Yves would ensue and I was off. And that’s how it’s been with each other book. Aimée’s got office rent to pay, a business to run, upkeep on a crumbling 17th-century townhouse flat with archaic plumbing, a bichon frise to walk on Seine quai, and a penchant for bad boys. In part Aimée’s journey, progression in her life and investigations mirroring what I discover in Paris, the society, immigration issues, in this book corruption in the government and it’s a flow streaming from that time. We meet Aimée in November 1993 and twelve books later it’s January 1998—only a little over four fictional years have passed. But the background setting she experiences are the seasons, the current scandal, the Princess Diana car crash. Each book is a long snapshot of the time, this era in the nineties that’s her life when people pay in francs and you can still smoke in the cafes. And the Paris I rediscovered visiting often for research. But to get the details, the stories, the insight from the ‘experts’ I needed and still need help. Friends have friends, and their introductions in Paris open doors. In my case doors to private detectives, police, and local cafe owners. Over the years I’ve built up these connections, nourished them with bottles of wine over dinner and running possible scenarios by these experts, some of whom have become friends. “I want you to get it right,” a retired Commissaire once told me, “if you’re writing a book set in Paris, a real city, you need to get the police system and all the details correct.” I appreciate that and the time he takes meeting with me and talking. He was in charge of the Princess Diana investigation and has provided a wealth of details. OK, so many crime writers kill people on the page for a living, but in my case it pays for my habit. Going to Paris and doing research. There’s so much I don’t know, I tell my husband, so I have to visit the archives, libraries, interview computer hackers, etc. He just nods. “I know.” In Paris on the cobblestones, in the Métro I get a spark of a story, a detail, overhear a conversation I’d never hear otherwise. My novels aren’t set in the beret and baguette Paris, or the tourist areas, but off the beaten track, the backstreets and courtyards of quartiers not often seen. More like a sociological slice of life in the darker side of the city of light. The areas Aimée explores from the sewers to the morgue to her decaying elegant 17th-century apartment on the Île Saint-Louis. It’s a trip to Paris without the airfare to an area you probably haven’t seen before. Over the course of the books, Aimée’s developed and I’ve gotten to know her more. It’s been an organic process, certainly not one I expected. So in beginning a book, I think back to my editor’s words, start with a particular part of Paris that intrigues me, of a story that could only happen there and feel driven to tell it. This district of Paris is a character. The murder, while important and propels the plot, isn’t the focus, it’s how the murder impacts Aimée and why she would investigate, the family and friends surrounding the victim, the community and this little part of Paris. A way to explore moral ambiguities and the grey areas when murder isn’t black and white. Cara Black writes the bestselling and award nominated Aimée Leduc investigations set in Paris. She lives with her husband, a bookseller, and son in San Francisco. She gets to Paris whenever she can. German-occupied France during World War II might not seem ready fodder for a writer of psychological thrillers, mysteries, children’s books, geology texts and trade books, but once I had a look at it, doors kept opening. Bellringer, the 13th in my St-Cyr and Kohler series, tracks murders and other crimes in the most unusual of places: the Internment Camp for foreign nationals that existed in Vittel’s Parc Thermal, an internationally famous spa but also—now get this—a giant hospital during World War I for the American First Army. Ah mon Dieu, I can relate the two, n’est-ce pas? Delicious. Terrific. Any number of possibilities, and once I’ve met the characters as they come up in the story, the mystery not only develops but puts on its edges. Almost 1,000 American women are crammed into the Vittel-Palace, nearly 1,700 British women in the Grand, two side-by side Louis XIII Renaissance hotels with rusty chimney pipes trailing wood smoke from the windows. Locked up, surrounded by nine-foot-high barbed wire, they are Allies elsewhere, oh for sure, but enemies here at the time of the story, 20 February 1943, and there’s a bell ringer among them. Always in this series, I set my stories in and out of Paris. Hence Mayhem, the first, begins in Fontainebleau Forest with what Kohler, my German detective, calls a “nothing murder”, while St-Cyr, my French detective, replants a birch sapling that has carelessly been torn loose and tells him it’s far from nothing. Carousel is set in Paris, and especially in Belleville where, among other things, St-Cyr’s second wife and their little son live in the house of his late mother, and the boys on the rue Laurence-Savart get him to play soccer. Kaleidoscope takes them to Provence, Salamander to Lyons, Mannequin back to Paris and on. As a result we see the Occupation in varying parts of the country, the black market, the food shortages, the making-do (le système D), the way every balcony is a little farm, les maisons de passe et filles des rues aussi. Always there are those elements that trigger common crime and add their little touches. Gerbils, anyone? Cats, especially those the Occupier calls roof rabbits? Hey, mais amis, while le Maréchal tells us not to eat them because they kill rats that carry disease, the Führer tells the Germans they’re tasty and even gives them recipes. Jean-Louis St-Cyr is a Chief Inspector with the Sûreté Nationale, Hermann Kohler only a Detective Inspector, but of course of the Gestapo since he had to be if history is to be followed. So we have these two honest cops fighting common crime in an age of officially-sanctioned crime on a horrendous scale. And certainly they agree to disagree, and having two of them allows me to pivot action from one to the other, and this helps to build suspense. And of course, since St-Cyr has to work for the Germans, la Résistance can and do make mistakes, and he is considered a collaborator by some and is sent one of their little black pasteboard coffins, complete with his white-chalked name, its Vs-for-Victory and Cross of Lorraine. Merde! but if that is not enough, both run afoul of the SS and Gestapo, and Kohler is especially targeted. Ah bon, they are two very different guys, thrown together by circumstance, but also former enemies in World War I, both having been veterans of Verdun and such, but on opposite sides, a fact they never forget. It’s one of the things that brings them so close together. It also makes them totally honest, another reason for the bad guys to get after them. Ah merde again. Often I’m asked how could I have come up with such a combination. I always answer that as a writer these things happen when you least expect. I had written and published The Alice Factor, a thriller about diamonds and coded messages in the late 1930s and into World War II. My editor had said that I must cut the MS length (!) and suggested I take out the French section. So okay, who hasn’t come up against this sort of thing? But I then used it to write another thriller—one I’m still working on (!) and at the end of that, since it had a bad Sûreté, a really miserable salaud, I remember asking myself, Hey, what about a good Sûreté in all of this? He would need a German detective as his partner since everything during the Occupation had to have its overseer from the Third Reich. Hence Kohler. But having grown up during the war, I had come to hate Germans with a passion. How could I possibly write a good one? On that very first day back in 1990 or ’89, Hermann Andreas Kohler ran away with the story in Mayhem and I had to cut him back and am still having to. And of course I no longer hate les Allemands. Why would I? Bellringer will soon be published by Mysterious Press in New York, who will also release in e-book form (with print-on-demand) all twelve of the others. One a month is planned and by then I should be well into the 16th, for in my layoff I’ve written two others. Like a lot of mid-list authors I had lost my publisher and far more recently my agent, leaving me to do what I should have: reach for the telephone. Very quickly, early last December, I got a contract for the first twelve books and then, having submitted Bellringer on the 21st December, received its contract on the 26th. Granted the person I had called at The Mysterious Press knew mystery novels like few others, and certainly knew of me and my books, but all of a sudden my two detectives were right back in business. St-Cyr and Kohler have been with me for at least the past 22 years. Whether I write mysteries that are historical novels or vice versa, what really excites me is not only the Occupation and all that it represents, but France, its varied terrain with very different communities, and the richness of its past. In Madrigal my two detectives come up against medieval wall-paintings, fabrics, songs and perfumes as well as far more recent cagoulards. In Stonekiller, it’s the Dordogne and cave paintings of 20,000 or so years ago but also Herr Himmler of the SS and Gestapo trying to use that same history to justify the Third Reich’s conquest of France. 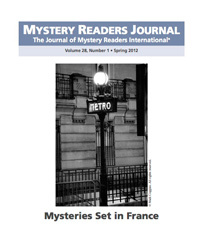 And this penchant for history is why the Western Society for French History chose to hold a plenary-session panel on my books: “Where History and Mystery Meet in the Crime Novels of J. Robert Janes”. I was terrified of course, for they were all professors, but fortunately it went off well and I made some remarkable friends. Always for me #1 is mystery; #2 is France and its increasingly brutal and corrupt Occupation; #3 is common crime and those who fought it; and #4 is Jean-Louis St-Cyr and Hermann Kohler. I have written about my home country of Scotland. I have crossed the Atlantic and written about the United States. I have travelled to the Far East to write about China. Now I am writing about my adopted home—France. And in many ways it is the most difficult assignment yet. I started going to France nearly forty years ago. I bought my first house there twenty-five years ago, and I have lived there full-time for the last ten. The mistake that those in the Anglo-Saxon world make is in thinking that because the French look like them they are like them. They are not. And it is not just a matter of language. It goes much deeper. It is cultural, political, societal. Although ostensibly a Catholic country, France is determinedly secular, and really quite irreligious. Vast amounts of money are lavished on what are seen as the twin pillars of civilised society— health and education. A recent OECD survey into health services around the world placed France at No.1—while the United States languished around 37th. Not a reflection of healthcare standards, but one of access. The French education system is widely regarded as one of the best. At its top level, attained only by exceptional academic prowess, a system of Grandes Ecoles (literally, big schools) turns out the civil servants and politicians who have been running France since the Second World War. And they have achieved remarkable things. France has an infrastructure second to none—a network of motorways that feeds every part of the country, like the body’s cardiovascular system; high speed trains by which you can set your watch; eco-friendly tramways being installed in every large and medium-sized city; a nuclear power programme that provides around seventy percent of the country’s electrical needs. The average French worker enjoys at least five weeks’ vacation each year, much more than his Anglo-Saxon counterpart, and yet the French worker achieves a higher rate of productivity. He then uses his vacation time to indulge the French love of family. Every break from work, of even just a few days, sees a mass migration around the country, as people return to their roots and families gather to enjoy long meals around tables groaning with good country cooking. Writers and artists are universally revered. Not in the sense that the Brits and Americans have developed the cult of celebrity, but in a way that manifests itself in genuine respect. Talent is cherished, and the French love-affair with the written word is undiminished. Every village, small and medium-sized town, and city, has its own annual book fair. Writers are invited, and people flock in their thousands to meet them, to buy their books and have them inscribed with very personal dedications. Even the genre of crime, in which I write, is regarded as literature. The French call the literary crime novel the “roman noir”—the black novel. Crime writing festivals—salons de polar—are to be found throughout the country. So it is little wonder that it is here that my career has been both nourished and celebrated. My series of China Thrillers have become bestsellers, and my Lewis Trilogy was critically acclaimed, nominated for and winning several literary prizes. It was my novel The Blackhouse, rejected by every major publisher in the UK, that was taken up by the French, who bought world rights and turned it into a huge bestseller across Europe—including the United Kingdom, where it has now sold nearly 200,000 copies. So how to write about this hugely diverse and culturally different country? Only through the eyes of an outsider. For you are born French, and no matter how many years you might live there, you will never be French. As as result I created the character of Enzo Macleod, a Scot with an Italian mother who has lived in France for the last twenty years and has a French daughter. This, it seemed to me, was the only way to write from the inside and the outside at the same time. Enzo is a former forensics expert, now teaching biology, who is endeavouring to use new science to solve old French cold cases. There are five books in the Enzo Files series. They are published in America by Poisoned Pen Press, are rapidly being bought up around Europe, and shortly to appear in the UK. But a French publishing deal still seems a long way off. For although I have been adopted and lauded as a foreigner living and writing in France, French publishers prefer that I apply my writer’s observations to other countries. Which is a shame, because as I travel around France my French readers tell me they are desperate to read about Enzo. Perhaps one day they will. The Blackhouse, the first book in the critically acclaimed “Lewis Trilogy,” will be published in the United States in September.